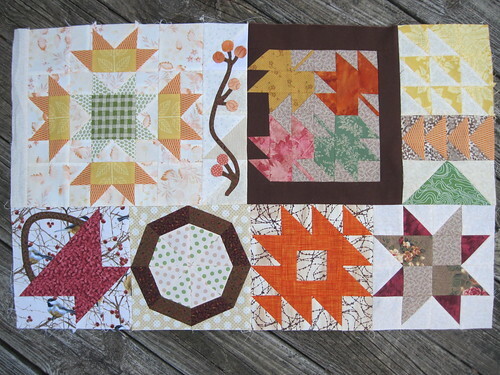 The top row features a squash blossom, an applique branch, maple leaf cluster, and several flying geese blocks. The second row includes a basket, a wheel, Rocky Mountain Puzzle*, and finally Duck Tracks*. 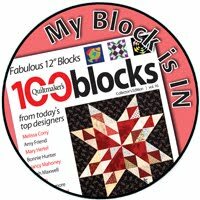 (Patterns for these last two blocks can be found on Quilters Cache.) This section measures 20" x 32". 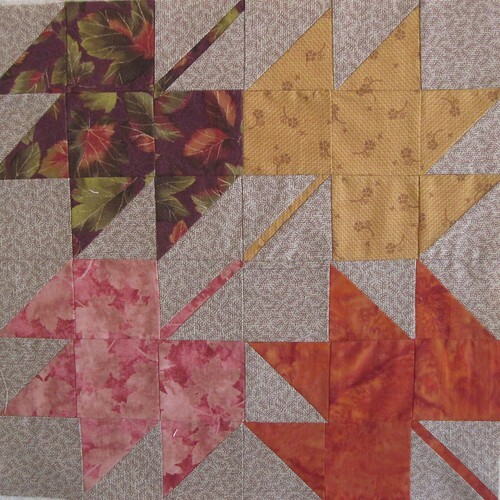 Due to the odd size of the maple leaf cluster I added a strip of fabric to the left side of the squash blossom block to bring the string of blocks up to the correct length. I'm so happy to have made a bit of progress on this quilt! 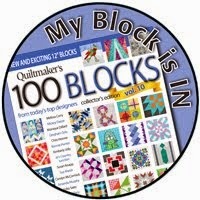 Now I have to discipline myself and return to two quilts in the process of be quilted. 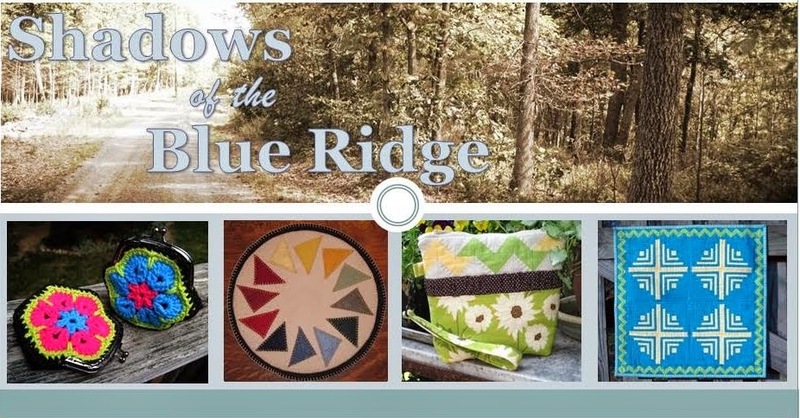 One is the Social Climber quilt from the Faith Circle, and the other is my Mixed Flock quilt for the local show. I've made good progress on the Social Climber quilt and it shouldn't take too much longer to have it finished. 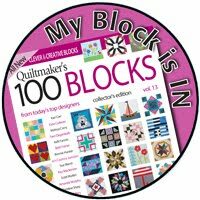 I need to stick with straight line quilting because I don't think my free-motion is where I want people giving it close inspection. I still have not figured out how to quilt the colored stars. I'm hoping that as I begin working on it additional inspiration will come. 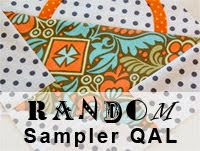 In my previous post I noted how Anita, from Bloomin' Workshop, is once again leading a group of quilters on a journey...this time to finish the Random Sampler quilts we started some time ago. Earlier this week she posted The Finishing Plan. 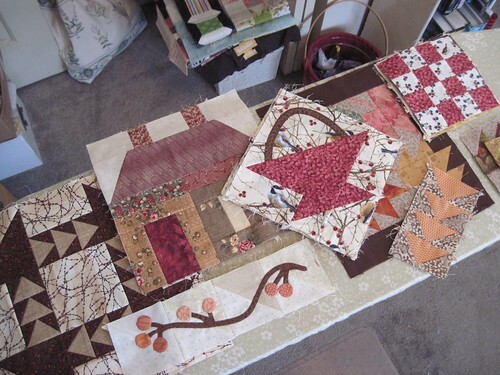 Until reading her post I had no idea how to take a mish-mash of blocks and turn them into a layout that would end up as a quilt top. 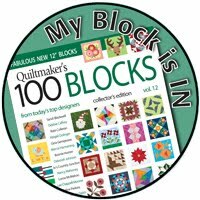 To begin the process I decided to take inventory of my blocks - how many different block sizes have I made, and how many of each size. 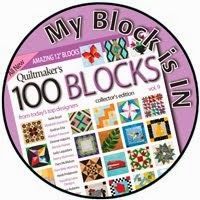 At this point I have blocks ranging in size from 2.5" square to 15" square. I know! 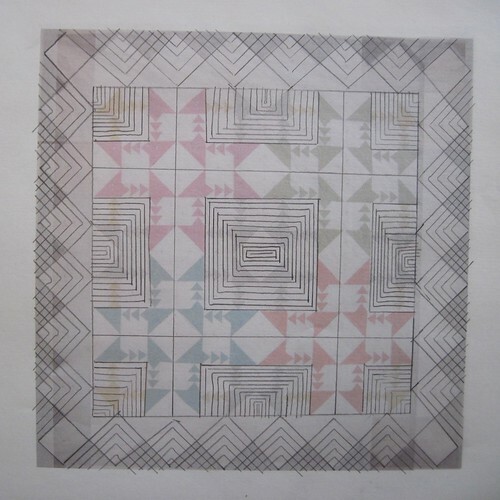 Where did this weird quilt block come from? This maple leaf block is the odd-sized one. I'll probably add borders to bring it up to a more workable size. 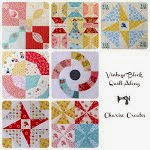 I can't even remember how many years ago I made this block - early in my quilting career. 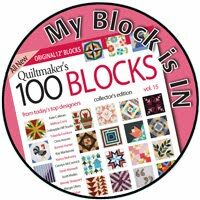 It's a bit wonky, but I love it :o) When we first started this quilt along I pulled this block as my cornerstone to build the sampler around. 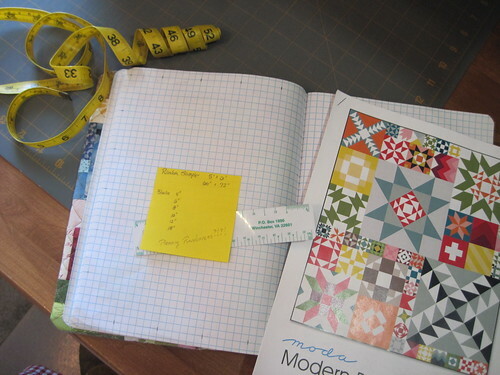 I've pulled my instructions for Moda's Modern Building Blocks quilt and I'm looking at the breakdown of this layout to inspire me how to divide my quilt top into sections. 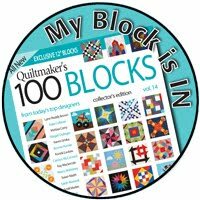 My quilt will be in the neighborhood of 60" x 72" so I'll play around with the mental challenge of how to best divide that into sections. Then, as Anita suggested I'll work on filling one section at a time. This will be fun!